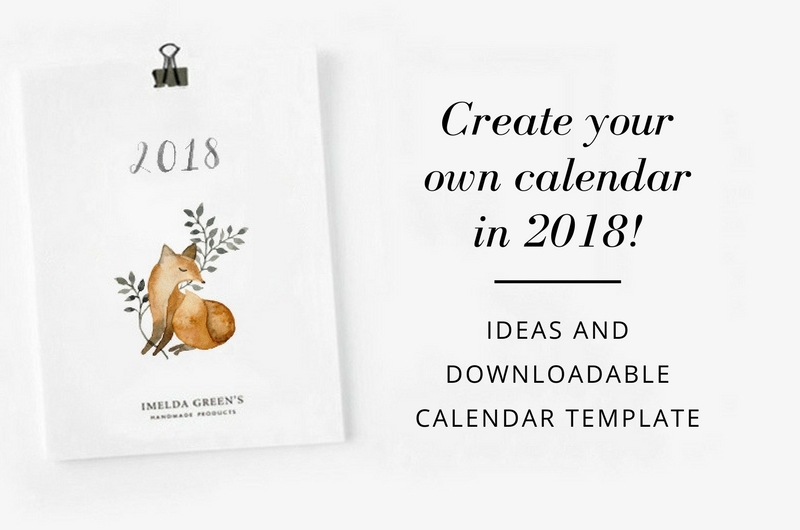 Create your own calendar in 2018! There is only one thing better than creating: creating together. Okay, now I’ve sacrificed honesty for a bit of PR, in fact nothing gets me more panicky than creating with other people around me, but the situation is slightly different now: I’m inviting you to create a calendar with me for 2018! Monthly downloadable calendars have nearly become a tradition on this blog, but during the holiday season you might have a couple of minutes to create something on your own. So, just like last year, I have created a blank calendar template, which you can download for free from the blog’s content library and decorate according to your liking. Creating a calendar is a good activity in many ways but it is especially good for your creativity as you must produce an entire series of pictures. Almost like an art challenge. You can reach a consistent look by choosing similar topics, colour palette or using the same medium throughout the series. Just like a themed Instagram account – with the difference that the number of pictures is not unlimited. Let me give you some examples! The floral – this blog also featured a set of floral calendars in 2016. There is something truly elemental about finding plants suitable for the different months, bringing you closer to nature. Your fav animal – the number of cats, the number of different poses, colours, characters. Finding 12 variations is not even a challenge. Of course you can exchange ‘cat’ to your favourite animal, I’m sure that even goldfish has 12 very different characteristics that you can capture. The abstract – it is sheer bliss painting watercolour splashes without any given shape or form – so much so that it was the theme for this year’s calendars on this blog. But you can think of repeat patterns too, if you joined the repeat pattern challenge this year or last year, you’ll have no trouble finding topics for your calendar. The photographic – for a moment, try not think about family calendars, this is about something else. Choose photos from your Insta, or browse through the photos you took these past couple of months. Which convey the mood of the particular month the best? If you’ve never shot pics just to capture the atmosphere, then this is the perfect challenge for you in 2018. Find the essence of each month in photos! For more ideas look for last year’s post! Drawing or painting is a perfect way to look back at your year or start planning the next one. Even if you don’t actually think about your plans, thoughts about the future will form subconsciously while you work on next year’s calendar. While you slow down during painting, your brain works at the background, which also helps you process your experiences of this year. 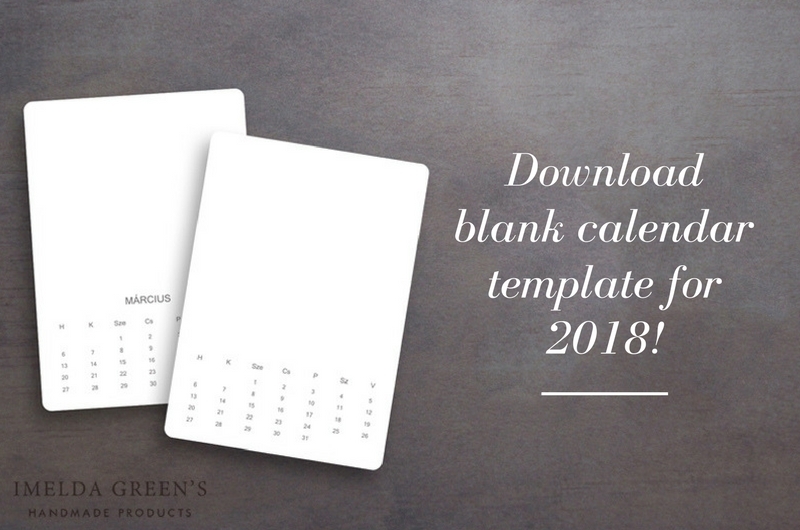 You can find the calendar template for 2018 in the content library, from where you can download it for free. To reach the content library, you need a password, which is included in my newsletter. If you haven’t subscribed yet, now is the time! :) If you’ve subscribed already, you can find the password at the bottom of the latest one. I’ve created the calendar in A4 format, but you are free to print it in smaller or larger size, depending on your creative ideas. I left the months’ names blank, so you can use brush lettering as well. Choose your paper carefully, think about the media you want to use and choose the paper accordingly. If you don’t like spiral bounding, you can use lovely paper clips or rustic strings to hang your calendar, they all make lovely results. Happy creating! If you like sharing your art via Instagram, don’t forget to tag me @imeldagreens, I’m really curious of your work! 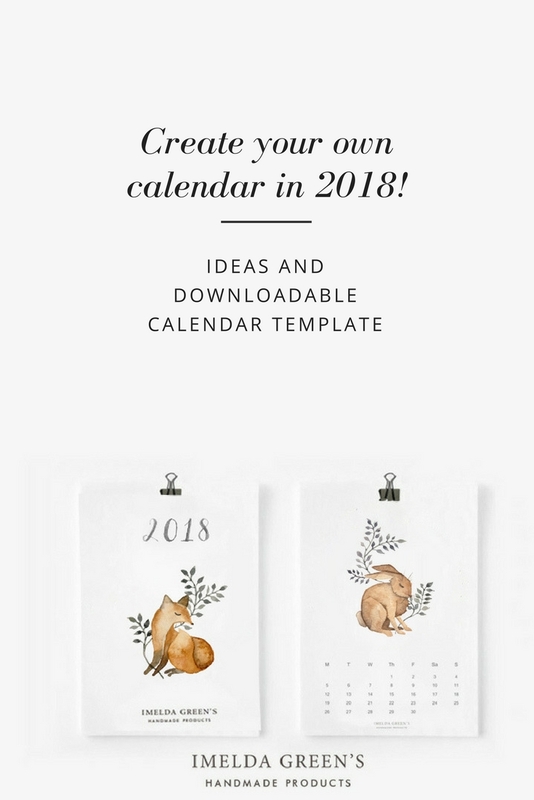 I never thought of creating my own calendar as a way to help with creativity, but I love the idea! I will look into some of your resources!